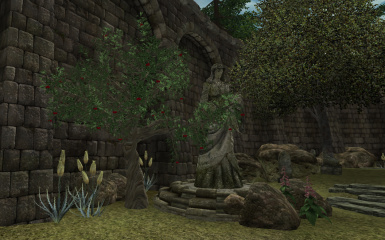 An add-on to Qarl's Harvest that adds 60+ harvestable and seasonal fruit trees and bushes to locations throughout Cyrodiil. Qarl, for the master file. Fixed mysterious duplicate apple tree outside Chorrol. Added pear tree for Feldscar. Cherry, apricot trees plus raspberry plants added. Partial Qarl's patch for Better Cities added. 28 Nov 14: Fixed script delay problem. No surplus pears showing. This is an add-on to the classic Qarl's Harvest and requires that it be installed for this mod to work. (Sadly, Qarl is no longer with us; besides Harvest, he will perhaps be most remembered in Oblivion circles for his Texture Pack, possibly the most popular of its ilk.) It also, as of version 1.1, requires OBSE 13+. This is a bit of a portmanteau mod. It just started as a simple expansion of the range of harvestable trees in Cyrodiil. Qarl's original included mostly apple trees and some orange trees; this adds 60+ harvestable trees, mostly pears, but now including cherries, apricots, peaches, damsons, olives, almonds and pomegranates as of v1.1.4. In addition, a number of raspberry plants, using Qarl's methodology, have been placed around various farms. Except for vanilla ingredients (apples, oranges and pears), new ingredients are added to a bunch of vanilla levelled lists, including vendors, when in season, and removed when not. Since the game starts in late August, nothing - including upcoming ingredients - will go out of season at the end of that month, though some may do so before it. But I expect to be pretty harsh to February, I've never got the hang of Februaries myself. In addition to this, I have also used these trees, including some copies of Qarl's original apples, to enhance the Wayshrines of the Nine (which, let's face it, are pretty boring). I've dedicated each species (except for Qarls' oranges, which Nocturnal seems to have dibs on) to different Aedra, and placed trees at their shrines and close to their chapels. The new ingredient effects are therefore restorative and tend to affect the attributes governed by each of the Nine. Vanilla ingredient effects remain unchanged, of course. I have also placed a lot of pear trees in some obvious vanilla locations that were lacking Qarl's original fruit trees, but most, you may find, are in some odd spots. This is because I have taken this opportunity to show recognition of some other well-known modders' work by placing trees close to some of the settlements that they have created. Of course this will not be apparent if you do not have their mods installed, but I hope you will still find the trees a useful adornment to the countryside anyway. Some of the mods involved are mentioned in the compatibility section. OBSE, any version. In fact, you will need better than OBSE v13 to take advantage of the levelled list feature, but the mod will simply turn this off if you have an earlier version. As of November 2017, I have suggested you install EngineBugFixes to clear the 'missing landscape' problem. The mod will run without this, but it is highly recommended. I think it might be a good idea to make a clean save before updating. Well, if you go and plonk 60+ trees all over the shop, you are inevitably going to end up with clashes somewhere or another. However, this is explicitly designed to work with some of the more popular settlement mods, and in fact to complement (and compliment) them. 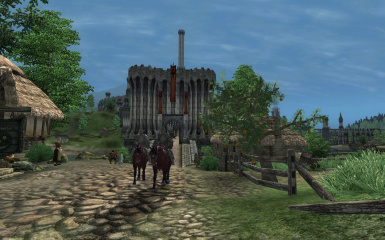 Among those are: several of Shezrie's Towns and Arthmoor's settlements; AFK_Weye; Region Revive Lake Rumare; Brina Cross Village; MTC Expanded Villages; and Bartholm. I have, I hope, taken good care not to crowd those fine mods, especially with respect to path grids. So I hope we have positive compatibility there. Chorrol BBC: Half-buried tree moved to outside Grey Mare. Skingrad BBC: Placed lost tree (buried in houses) by well. Dark Forest UL: Fixed floating tree near Hircine's Shrine. Chorrol Hinterland UL: Moved tree by stables crowded by UL tree. These changes also work with vanilla. Additionally, the original city trees, like those I've added, now also work with Open Better Cities. Anyway, please report any other issues you find, and I'll fix them if at all possible. Oh, and this mod has been fully cleaned, automatically and manually, with Tes4Edit. I've now put in a lot of mesh fixes. It's a matter of balancing; making sure that fruit stands up stably on the tree, but also rolls around if it's thrown to the ground. It's a compromise, so I've likely not got it totally right yet. Stroti for the old cabin resource I haven't deployed yet. 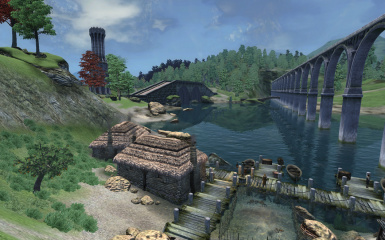 And for the inspiration - Arthmoor, Nernie, Shezrie, Thomas Kaira, and everyone else involved in adding and expanding the towns and villages of Cyrodiil. Bethesda, for the game and CS (though big thanks to ShadeMe too, for extending the latter). They're rather humble at the moment, but please feel free to use whatever resources I have created in your own mod project. Modify them if you will, but please remember to give me credit for the originals. Additional notes will shortly be supplied in a separate document, largely for my amusement. You will not have to read it.